Here in this tutorial we will go over steps on how to speed up Eclipse performance by simply changing eclipse.ini file. 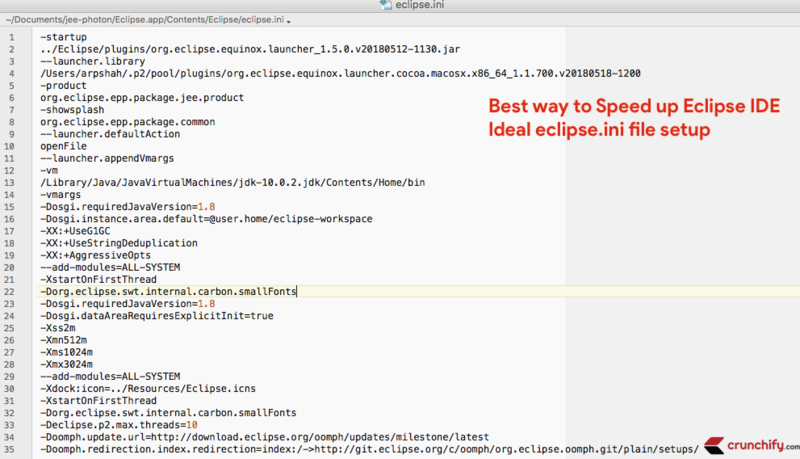 Why we need to modify default eclipse.ini file? Basically I modify below things in eclipse.ini file based on Java 10 JDK configuration. Please replace your eclipse.ini file with this one. Make sure to change line 4 and 13. Double verify your VM path else you your Eclipse will throw JVM path error. NOTE: There is no permgen setting since JDK8. If you are running Java7 and below I would suggest you to add PermGen setting too. Please update line 4 above with your user path. Hope this helps you speedup your Eclipse IDE and workbench. Let me know if you face any issue modifying eclipse.ini file.